Emergencies are a fact of life. They can happen at any moment in time. Now, I’m not talking emergencies as in breaking a nail or a bad hair day. I’m talking stranded in the middle of nowhere, zombie apocalypse type emergencies. In cases like this it’s important to be prepared. 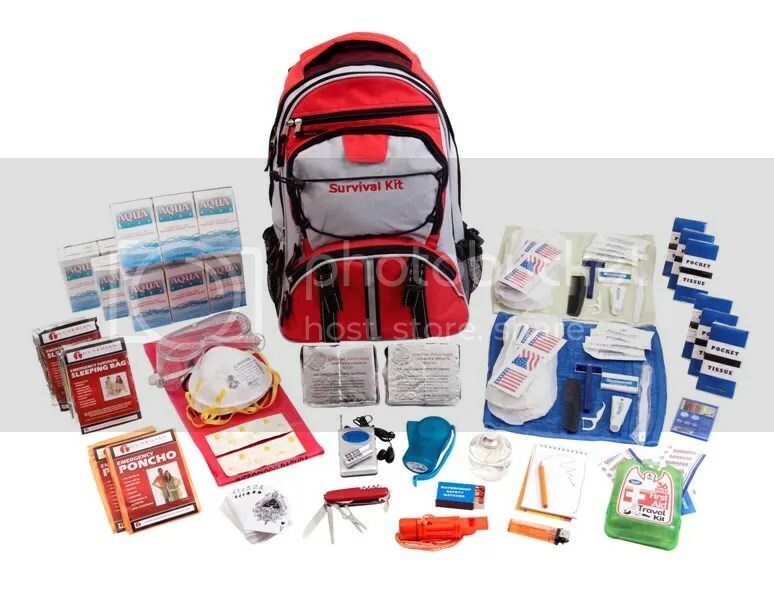 The point of the emergency kit is to be able to survive for a short period of time until help comes (if it comes). Water first. Water is probably the most important asset to an emergency kit. Water can be stored for six months, but you need to make sure that the water is sealed in its container. Milk jugs have bad seals so are not recommended for long term water storage. Try to keep up on this, though. You may not think about how vital water is, but it is extremely important. And you will need about a gallon of water per person, per day. Food is the next important issue. Packaged and canned goods are best, just make sure you have all the things required to make them. For instance, canned veggies and meats are good for this. FEMA states that you need to make sure to keep in mind any special diets that members of your family may need and avoid foods that make you thirsty. You will need to do the same for pets. Buy a spare small bag of food for your specific animals and store extra water for them. Some animals should not eat foods meant for other animals. Cats need a much higher protein content than dogs, for instance. Learn what you can about your area. From plants to geography. This information will come in handy in case of an emergency, especially in the form of an apocalypse. Anyone with children can well attest to needing things to keep them preoccupied. Toys, coloring books, and crayons should serve that purpose. Books for older children. Babies should have spare cans of formula and extra packages of diapers set aside. You should have a spare kit set aside with any emergency stash you have. This should be considered off limits except in emergency. It’s a good idea to keep another kit for semi-everyday use. Stash a small bottle of bleach aside for the purpose of purifying water. Miscellaneous stuff should also be added to your kit. Women should take a moment to put aside extra monthly necessities (including a few changes of clothing). Flashlights and spare batteries are obvious. So are matches. A radio can be more helpful that you would think, for both entertainment and updates on what is going on around you and spare batteries for it. A can-opener (hand-operated) is necessary if you have canned goods stashed. Spare bedding and clothes. A pot, a pan, and silverware are necessary. Plastic and paper dishes could be bought and stashed with the kit. Candles would be handy so you don’t use up your batteries. Finally, keep the kit where you can get to it. A specific closet in the house, the trunk of your cars, a drawer (you would need a very bare essential kit) in your office. Being able to have access to your kit is important so that you can keep updating it as necessary. Also, if an emergency hits, you don’t have to run around and throw things together… you would already have everything in one place! And don’t forget to make sure everyone in your family knows where it is at so if you aren’t around, they can get to it if needed.